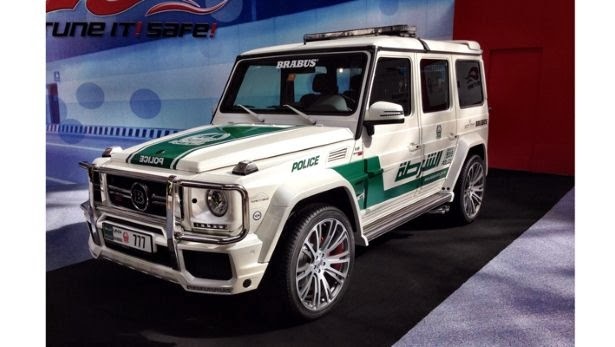 Dubai Police has added Mercedes G63 AMG to its fleet now. Earlier we also saw Dubai police adding Lamborghini to its fleet. The 690bhp B637 "700 Widestar" is the latest lump of exotica the Emirati rozzers can tool around in. And with a top speed of 149mph, 0-60mph time of 4.9 seconds and a roster of off-road credentials, it'll be able to bring many deserty high-speed pursuits to a close. Finished in white with green police decals, the SUV also gains a roof-mounted light bar, additional LED lighting at the front, 23-inch alloys and Dynamic Ride Control suspension. The Brabus B63S 700 Widestar is currently on display at the Dubai motor show.